The 64 braille patterns are arranged into decades based on the numerical order of those patterns. The first decade are the numerals 1 through 0, which utilize only the top and mid row of the cell; the 2nd through 4th decades are derived from the first by adding dots to the bottom row; the 5th decade is created by shifting the first decade downwards. In addition, for each decade there are two additional mirror-image patterns, and finally there are three patterns that utilize only the bottom row of the cell. The final pattern, the empty cell ⟨⠀⟩, is used as a space; it has the same width as the others. Cells 1 through 25 plus 40 (w) are assigned to the 26 letters of the basic Latin alphabet. The other 37 cells are often used for punctuation and typically assigned different values in different languages. The English grade-two values are as follows; cells with dots on only the right side do not have equivalents in printed English and are explained in the notes. When printed ch, gh, sh, th are pronounced as two sounds, as in Shanghai, hogshead, and outhouse, then they are written as two braille letters rather than with the ligatures ⟨gh, sh, th⟩. Generally, other ligatures should not be used if they might cause problems with legibility, as with the ing in lingerie, though they tend to be with familiar words, such as ginger and finger, even if their pronunciation is divided between syllables. None of the ligatures are to be used across the boundaries of compound words. For example, ⠷ ⟨of⟩ is not used in twofold, nor ⠆ ⟨bb⟩ in dumbbell. The rules state that they should not span a prefix and stem either, so for example the ed in deduce, the er of rerun and derail, and the ble of sublet should be written out in full. In practice this is variable, as it depends upon the awareness of the writer. The of in professor, for example, might not be recognized spanning prefix and stem, and no-one has a problem with a-cc-ept or a-dd-r-e-s-s, despite the technical violation. There is also conflict with the overriding tendency to contract sequences that fall within a single syllable. So the same writer who divides the er in derive may allow the ligature in derivation. A similar pattern emerges from suffixes: ⟨ed⟩ is not used in freedom, since it spans stem and suffix, but is used in freed, because it forms a single syllable with the stem. What is considered to constitute a prefix or suffix is somewhat arbitrary: ⟨st⟩ is not used in Charlestown, for example, but it is in Charleston. Ligatures may also not separate digraphs or diphthongs in print. For example, aerial does not use ⟨er⟩, Oedipus does not use ⟨ed⟩, and tableau does not use ⟨ble⟩. Also, it is normal to use the letter ⟨ea⟩ for the broken vowel in i-d-ea-s or c-r-ea-t-e, despite it being pronounced as two sounds rather than one as in head or ocean. A diacritic in a word of foreign origin prevents the accented letter from combining with another into a ligature. For example, señor is not written with the ligature ⟨en⟩ as *⟨s-@-en-o-r⟩, because it would not be clear if the accent were supposed to be on the e (as é) or on the n. However, English words are contracted. Thus blessèd is written ⟨b-l-e-s-s-@-ed⟩, and coëducational is ⟨c-o-@-ed-u-c-ation-a-l⟩. The accent mark (here called the print symbol indicator) is used with punctuation when it stands alone, rather than suffixed to a word or number. For example, if someone's response in a dialogue is transcribed ⟨"? "⟩, in braille that would be written ⟨⠦⠈⠦⠴⟩. It is also used to derive a few symbols: % ⟨⠈⠒⠏⟩, $ ⟨⠈⠲⟩, & ⟨⠈⠯⟩. All characters a a through j j are interpreted as the digits 1 through 0 when they follow a number sign. This reading ignores intervening numerical and arithmetical symbols such as commas, decimal points, and fraction bars, until a non-number-compatible character, such as a period or a letter after J, is encountered, at which point reading reverts to the alphabetical values a–j. The number sign is repeated after a slash that's not used a fraction bar (like model number 15/07). For example, ​1⁄20 (one twentieth) is ⟨⠼⠁⠌⠃⠚⟩, but 20/20 [vision] is ⟨⠼⠃⠚⠌⠼⠃⠚⟩. The braille number sign has no equivalent in print. It is sometimes transcribed as ⟨#⟩. However, this is misleading: an actual printed # is rendered in braille as ⟨No.⟩, without an intervening space before the number sign ⠼. A single space ⟨ ⟩ (a blank cell, which has the same width as all other cells) is left between words and sentences. Paragraphs are indented with a double space. This is universal in braille, even when transcribing a printed text that does not indent paragraphs: Blank lines are not used for this in braille, though they may be used for changes of scene, etc. As much as possible, lines continue to the right margin, with words divided and hyphenated to fit. If this would cause an illegal sequence of ligature or contraction and hyphen, the spelling needs to be decomposed, or the word hyphenated differently. Unified English Braille (UEB) is an attempted unified standard for English Braille, proposed in 1991 to the Braille Authority of North America (BANA). The motivation for UEB was that the proliferation of specialized braille codes—which sometimes assigned conflicting values to even basic letters and numbers—was threatening not just braille-literacy, but also the viability of English braille itself. Also, the irregularities of English Braille made automated transcription inaccurate, and therefore increased the cost and time required to print in braille. In 1993, the UEB project was adopted by the International Council on English Braille, and expanded to cover the various national systems of the member states: Australia, Canada, New Zealand, Nigeria, South Africa, the United Kingdom, and the United States. 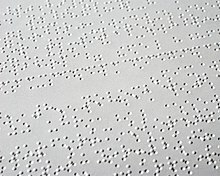 An additional goal became adoption of a single standard for all braille encoding, apart from music; with the exception of math-notation, this was largely achieved. New Zealand officially retains Māori Braille as compatible with UEB, and BANA officially retains Nemeth Code as a math-notation option alongside UEB for the United States. ^ "English Braille" normally refers to Grade 2. The more basic Grade 1 Braille, which is only used by learners, is specified as "English Braille, Grade 1" (Braille Through Remote Learning). ^ ⟨Angle brackets⟩ will be used to indicate transcriptions of braille letters into the Latin alphabet. ^ compare American (BANA) here with British (BAUK) here. ^ Also called "group signs"
^ This is reminiscent of writing "h8" for hate and "4ever" for forever, but differs in that the spelling of the parts cannot differ in Braille (8 is not spelled "ate" as in h-ate, and 4 is not "for"). ^ When a word has an established braille spelling without a ligature, the contraction is avoided in derivativations which would otherwise allow it, such as nosebleed and unblemished. ^ In an extreme example, for and with the people is written ⠿⠯⠾⠮⠀⠏. This convention has been eliminate from Unified English Braille, which spaces all words as in print. ^ ⠜ ⟨ar⟩ is a common exception to this rule, and is regularly used in common words which have a prefix a- before a root beginning with r, as in arise. The ligature ⟨ar⟩ would not be considered well-formed in the word infrared, however. ^ In words like canoed, toed, and shoer, however, the e is ambiguous between the stem canoe, toe, shoe and the suffix -ed or -er, and in such words the letters ⟨ed⟩ and ⟨er⟩ are used. ^ This can feel arbitrary: Lineage accepts the ligature, but mileage does not. ^ However, the restriction does not seem to apply to ea at the end of a word: teaspoon (ea) and eggbeater (gg) use the ligature. ^ In Unified English Braille they are specified as ⟨⠐⠣⟩ and ⟨⠐⠜⟩. ^ This is because single quote marks are the convention in the US for embedded quotations, and so are less common than the others. ^ But not with dates. For dates like 7/19/2012, a hyphen is used instead of a slash, without repeating the number sign. The number sign is only repeated after a hyphen when two dates (or other numbers) are joined, as in broadcast 1978–1984. So, the date-range format ⟨10/2–10/7⟩ is transcribed ⟨⠼⠁⠚⠤⠃⠤⠼⠁⠚⠤⠛⟩. ^ However, for abbreviations of units of measure which are not spaced, the letter sign is used even if the letter comes after J. 5ml, for example, is ⟨⠼⠑⠰⠍⠇⟩. ^ Quotation marks, italics, and brackets are replaced by the letter sign if their function is equivalent, or if the punctuation is retained (as in "see item (d)"), the letter sign is not used. ^ In Unified English Braille, a triple cap sign is used for extended text. ^ In Unified English Braille, these have separate formatting signs. ^ See Greek Braille for the braille codes for those letters. ^ Sometimes called "wordsigns" when they involve a single braille letter, and "shortforms" when more. ^ ⟨l⟩ is also used for £, the abbreviation of pound in British currency. Shilling and pence follow the printed abbreviations of ⟨s, d⟩. ^ Apparent exceptions, such as ⟨xs, xf⟩ for its, itself and ⟨yr, yrf, yrvs⟩ for your, yourself, yourselves, are quite limited in number and best thought of as separate contractions. ^ but not haven't, where the apostrophy does not immediately follow the have. ^ An exception are the musical notes do and so, which are spelled out as d-o and s-o. ^ Since the letters ⟨ed, er, ow⟩ are not used as contractions, they can be used for the words Ed, er..., and ow! ^ Note that ⟨in⟩ in pulls double duty: It is a simple braille letter, used for any sequence i-n in an English word. However, it also functions as the word sign for the preposition in, and in such cases follows the same restrictions as the other decade-5 words. ⟨en⟩, on the other hand, is similar to ⟨sh⟩ in that it cannot be used as a word, for example in the phrases en route and en masse. ^ ⟨in⟩ and ⟨to⟩ are regularly compounded as ⠔⠖ into, which is perhaps most easily understood as an independent word sign. ^ Because braille ⠌ ⟨st⟩ is a letter (phonogram or "groupsign") rather than a contraction, the printed sequence st will be written ⠌ in any word which is not otherwise abbreviated. ^ ⠉⠧ ⟨cv⟩ and ⠉⠧⠛ ⟨cvg⟩ are used regularly, as in ⠏⠻⠉⠧ ⟨percv⟩ perceive, but in addition combine with ⠙ ⟨d⟩, ⠗ ⟨r⟩, and ⠒ ⟨con⟩ for the further contractions ⠙⠉⠧(⠛) ⟨dcv⟩ deceive, ⟨rcv⟩ ⠗⠉⠧(⠛) receive, and ⠒⠉⠧(⠛) ⟨concv⟩ conceive / -ceiving. ^ They may however be used as common nouns within proper names, such as the titles of books. ^ The convention in braille is to syllabify an intervocalic consonant with the preceding vowel if it is both stressed and short, but with the following vowel if the preceding vowel is long or if the following vowel is stressed. So, for example, fā-mous but făm-ine, fī-ber but fĭl-ial, pū-nitive but pŭn-ish; also the verbs pre-sént, re-córd, pro-gréss vs. the nouns prés-ent, réc-ord, próg-ress. ^ Generally, if the sequence of letters spans a stressed to an unstressed syllable, or spans two unstressed syllables, the contraction is acceptable. However, it is generally not acceptable if the sequence spans an unstressed to a stressed syllable, where the syllable break is more salient. ^ There is a similar restriction against spanning root and suffix. However, in application this is somewhat arbitrary: fruity does not use the -ity abbreviation, but equally and totally use -ally. ^ "BANA Adopts UEB". Braille Authority of North America. November 2012. Retrieved December 18, 2012.